Middle Row: (from left) Ralph Field, Herb Jamison, captain Robert Hotchkiss and Jesse Gable. Back Row: (from left) Robert Bourland, Roland Woodward, Ralph Dougherty, Coach W. Geiger, Augustin Rousseau, and Albert Jamison. 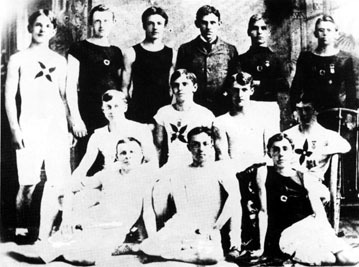 The first state track meet of the Illinois High School Association was held in Champaign on May 20, 1893 and Peoria Central, winning eight of the 16 events, was the winner. Nineteen schools took part, twelve scoring points, with Lakeview High of Decatur second. Central's 42 points would be the most scored at a state meet until U. High of Chicago managed 42 1/2 in 1914. A number of events no longer contested were on the program including the football kick, baseball throw, high kick and mile bicycle ride. For Central, Herb Jamison, who would be the silver medal winner in the 1896 Olympics in Athens, won the 50 yard dash in 5.75 seconds, the 100 yard dash in 10.40 seconds and the 220 yard dash in 23.25 seconds. Other Central winners were Ralph Field with a running broad jump leap of 20 feet, one-half inch; Clarence Herschberger in the pole vault at 8 feet, 8 inches; Albert Jamison in the mile bicycle ride in 2:49.5; Augustin Rousseau in the standing broad jump at 9 feet, 10 inches; and Robert Bourland in the shot put with a toss of 36 feet, 9 inches. In addition Field was second in the high jump, Robert Hotchkiss second in the baseball throw and high kick and Godfrey Luthy third in the mile run. Hotchkiss was captain of the team and W. Geiger was coach. The first state meet was held at the University of Illinois Athletic Field before an estimated crowd of 700. He did just about everything for Bradley University during a stay on the hilltop that covered almost a half-century. John "Dutch" Meinen was football stalwart, assistant football coach, assistant basketball coach, jack of all trades in the athletic department, and, finally, athletic director. Born in Pekin, Meinen first played football for Bradley in 1919 when the forward pass was almost unknown. He was a big, tough lineman who played in the trenches for the Braves for three years. In 1920, his junior year, a young coach named A. J. Robertson came to Bradley to coach football, basketball and baseball and the two became synonymous with BU athletics. Meinen captained the 1921 football team and by 1926 was Robbie's right arm in both football and basketball. When Bradley was entering the basketball big time with the advent of the Famous Five in 1936-37 and through the first two National Invitational tournaments and for many years after, Meinen was at Robertson's side through all the amazing wins of that era. 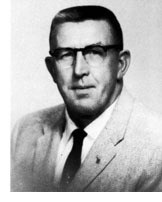 Meinen was named athletic director in 1956 and was in charge of the athletic department during Bradley's three NIT championships during Chuck Orsborn's basketball reign. Upon his retirement in 1965 he held the rank of Professor of Physical Education Emeritus. In 1969, Bradley's new baseball field was named in his honor. He died in 1971.